My friend Sarah was enquiring a couple of months ago about commissioning a blanket as a Yule gift for her cousin and her cousin's daughter. Unfortunately, she didn't get back to me in time and with all the other things I'm working on for Yule, I haven't the time! 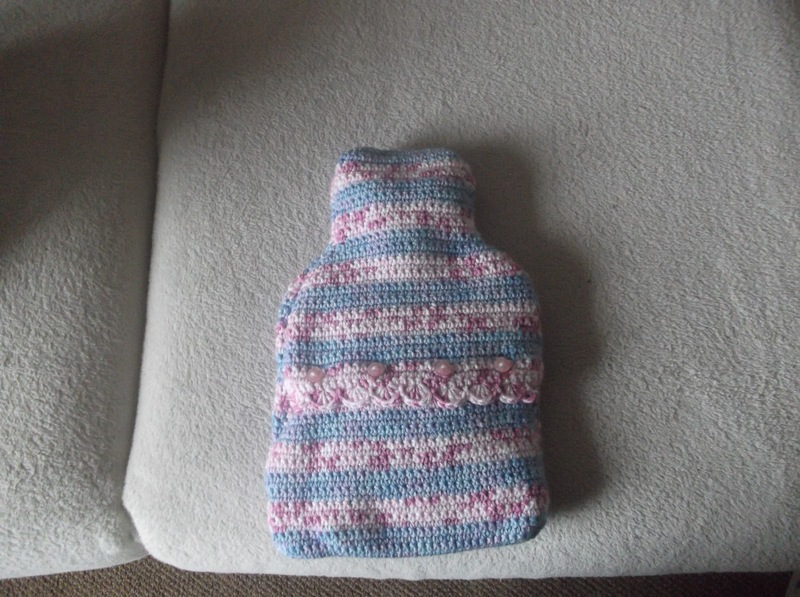 So instead she's asked if I can make a hot water bottle cover...As I've never made one before, I had a quick look on the internet but couldn't find a simple free pattern that I liked so I came up with my own. It's made in three pieces, worked in single crochet throughout apart from the edges of the flap which I've added a small shell stitch to. It's fastened by small pink buttons and I used Patons 'Smoothie' acrylic DK yarn. I'll try and put down the pattern here-be patient though as I've never typed up a pattern before and I hope it makes sense! As before, but instead of 36 rows, do 12 rows before starting the decreases. 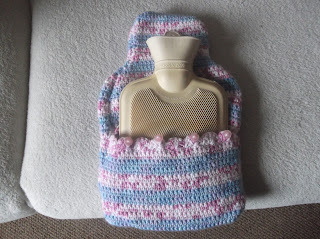 Turn right way round and add hot water bottle! Let me know if this write up works-I've never tried to write up a pattern before so I'm sure it's full of mistakes! *waves* Hi! I'm very keen to try out this pattern but I was wondering how many balls of wool/yarn you used to make this? I'll be completely honest with you and say that I think the solid crochet tends to insulate the heat too much-I've found just using the pattern for the top flap and making two large granny squares for the bottom piece works much better (less yarn too!) Instead of doing three pieces as outlined here, you make two large granny squares and two top pieces-as long as you make sure to put the button holes along the bottom of a top piece, it comes together really nicely! Whichever one you try out, I'd love to know how it worked out. I'm so happy when someone leaves me a comment and I read every one :-) Thank you for taking the time to comment on my little blog-I try to answer every comment where I can!